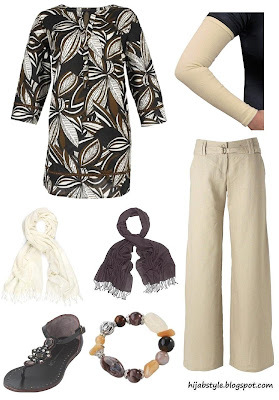 African print kaftan £29, Windsmoor; cotton arm sleeves £2.19-£2.74, Hijab Al-Muminat; stone linen trousers £15, Dorothy Perkins; cream wrap and chocolate wrap both £18, Monsoon; chocolate sandals £25, Dorothy Perkins; bead stretch bracelet £7, Debenhams. i went to primark today and got loads of long sleeved t-shirts for 2.50 each lol. so i can wear some nice tops i have with the long sleeved tops underneath. Glad you liked it! You know when Primark first started selling those I went a bit mad and bought one in every colour :D They're such a great buy! You're welcome! Are you going to buy the ones I've shown here? If so let us know if they're any good! Does anyone know where I can buy really long forearm sleeves like the ones shown in the picture, but in the UK, not the USA? Id really appreciate it if anyone could help me out! Also, has anyone seen a leg version of the forearm sleeve, whereby the ankle to knee is covered but the feet can be shown. That would be ideal to wear underneath skirts. Tights get too hot! Hayah, do you know were I can purchase those sleeves in the the UK? I would wear the 3/4 length ones, their so handy, what a good idea! I noticed those long egyptian cotton arm sleeves on that website quoted, but prices are quoted in $. Anon and Sayma, that site also ships to the UK. On the right hand side bar, if you scroll down, you can change the currency to £. Shipping is just £1.09 for a pair of sleeves! Fatima, were they the cotton or lyrca ones? fatima, which islamic bookshop did u get them from? somewhere in london?? iv wanted a pair of sleeves like the pic above, 3/4 for a while...didnt realise u could get them like this? !